knit. spin. dye. design. teach. i’m glad to announce that none of that is true. i finished something (rav link) and i’m in my first trimester of working on something else. i hope to get back to regular blogging soon… that is, if the massive amounts of rest i seem to need at the moment allow. in the meantime, i’m sorry to say that the business might dominate a bit. i’m still deciding if i like the handspun ties or not. what do you think? 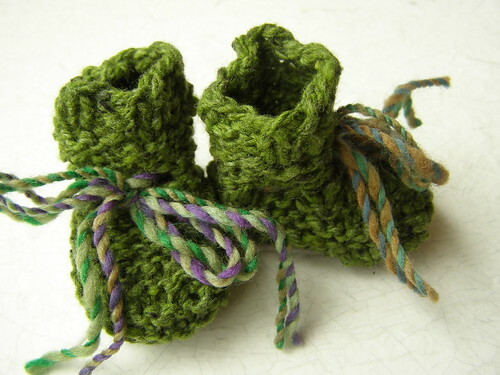 This entry was posted in knitting, socks, the fam by cosymakes. Bookmark the permalink. Wait, what do you mean by ‘first trimester’? Cute. And you won the contest last night at dinner for delivering the latest in the year. And you will find lots of uses for hand spun. yes, what does “first trimester” mean? Are you preggers?!?!?! Wow – I have my own baby, miss out on your blog for a couple of months (whoops!) and you get pregnant?!?! CONGRATULATIONS!!! When are you due? Cosy, I am over the moon for you. Wonderful news! Cosy, I think the hand spun ties are nice, but that pretty ribbon might be more baby-ish. 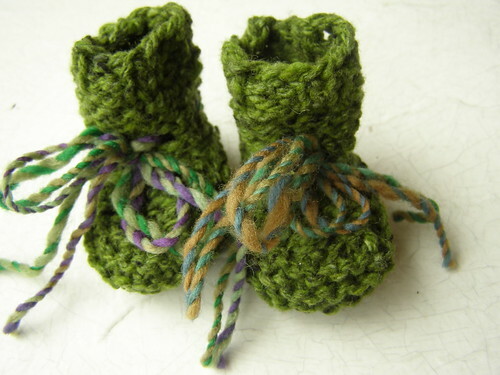 Colored buttons might alos be a little compliment to the knitted booties. whoa! YAY! i’m so very, very, happy for you! i like the ties. congrats!!! Congratulations, Cosy! I like the look of the ties. Aww, how sweet. Very happy for you. Cosy, congratulations to you and Ben! You seem like you both have so much love, compassion, and mindfulness to bestow upon a little one. I’m so happy for you! Under the weather but over the moon? Congratulations! I love the booties you made. The hand spun ties are super cute. Hang in there – 1st trimester exhaustion is rough. I hope it goes away soon! Congratulations! Oh that first trimester fatigue. Take it easy. oh congratulations! I love the handspun ties. I can’t imagine anything better. oh boy boy boy. I feel so excited for you! I just told my husband that I felt sort of nerdy about how excited I feel, given that you’re a bloggy friend and all, but I am! I can’t remember if you are vegetarian or not, but kale was my big iron + protein friend during pregnancy — my midwife was amazed that my iron levels were actually up during my 2nd trimester (I’m usually anemic,anyway, and most women get anemic during pregnancy, too). Hurrah! I just reached 2nd Tri myself! Good luck with it all! welcome to the club! I am so glad you have joined! Wow! I can’t wait to see more lil’ cosy knits! I’m so happy for you. wheeee! what an adventure you’ve begun! 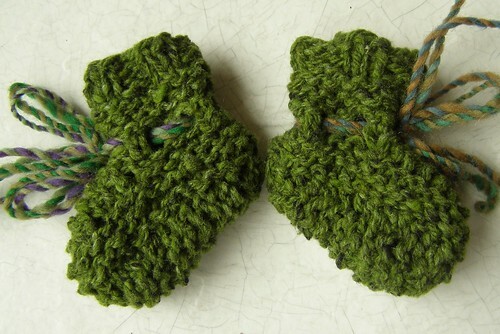 i love the handspun ties…this kiddo is going to have the most well-dressed toes and noggin, that’s for darn sure! Congratulations!!! Very exciting news indeed! I am so happy for you! Get lots of rest. Yay!! couldn’t stop by without congratulating you. hopefully the tiredness will pass soon and you will feel much more energetic. so much to look forward to! I am so happy for you, you’re going to be such a great mom. My daughter just turned 5 months old today. The Mom thing is hard work, but it’s more rewarding than I can even begin to express.